Home About Universe Astronomy Info Physics Quantum Mechanics Could This Be The First Dark Matter Particle? Could This Be The First Dark Matter Particle? The presence of dark matter has been known to scientist for decades, but working out what it is essentially made from has been a frustrating hunt. Professor David Cline has told a UCLA symposium of the discovery of what can be the first cold dark matter particle, an object weighing about 30 billion electron volts. The very first mark for dark matter was appeared in 1932 when Jan Oort noticed that different objects are spinning around the enormous plane as if our galaxy has noticeably more mass than we can see. This led astronomers to start further study on other galaxies and they found the same pattern. After this study two main and well known theories emerged: Massive Compact Halo Objects (MACHOs) and Weakly Interacting Massive Particles (WIMPS). Weakly Interacting Massive Particles (WIMPS) involves subatomic particles with no strong nuclear interaction or electromagnetic charge; Massive Compact Halo Objects (MACHOs) speculates objects much larger size like planets or stars that don't shine at all. It is predicted that the dark matter, which we cannot see, accounts for more than five times as much mass in the known universe as the normal matter. With time the weight of scientific support of existence of dark matter has moved to the idea that WIMPS account for most of what we are missing, but finding them has been more of a problem. Neutrinos were once believed to be the answer, but the neutrinos left over from the creation of the universe travel too fast, and so would be too equally spread, to account for the mass chunk around galaxies. 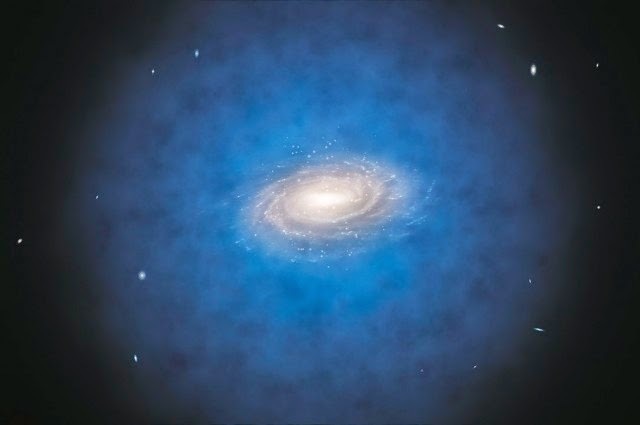 After every two years UCLA organizes a seminar to debate development in the search for dark matter of one form or another. Nothing has been published yet, but Cline, of the home campus's College of Letters and Science, commented, "At this symposium, it was obvious that excitement is building in the fields of dark matter theory and, especially, detection." The Fermi telescope formerly called the Gamma-ray Large Area Space Telescope has found mysterious gamma rays, which Cline considers may be produced by the particles. In underground laboratories efforts to get Weakly Interacting Massive Particles (WIMPS) to interact with atomic nuclei have failed to find anything, but Cline said, “there is no incompatibility [in these detectors' null results] with the interesting excess in the FERMI data." "Because dark matter makes up the bulk of the mass of galaxies and is fundamental in the formation of galaxies and stars, it is essential to the origin of life in the universe and on Earth," said Cline.